Introduction: Thoracic paravertebral blocks are increasingly being used for operative and post-operative pain management. They have been shown to be effective in thoracic and abdominal surgeries, as well as for patients with rib fractures. This technique has advantages over epidural anesthesia, but the technique is not without risk and difficulty. This study is to assist with landmark-based TPVB technique. It has been shown that if the needle initially lands on the TP, then guiding the needle to the TPV space can be more reliably effective and safe. The problem with predetermined distances and entry points is the oversimplification of the human anatomy and the extreme variability of depths and distances in different individuals (and even in the same individual at different areas of the thoracic spine). There is a large variability in depth from skin to TP (1-5cm). The authors propose that there is a way to estimate the depth of skin to TP safely without the need for ultrasound. 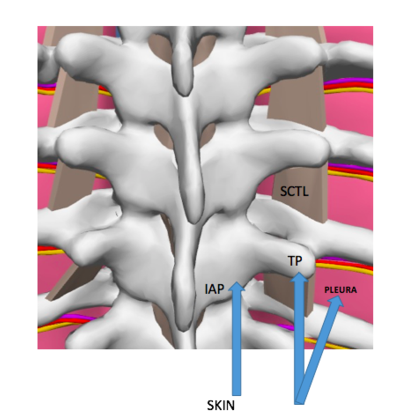 The authors propose that the depth of skin to the inferior articular process (IAP) is a distance that is deeper than the dorsal aspect of the TP at the same level, but that is shallow to the lung. 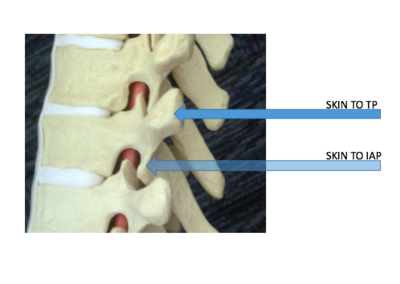 This depth can be determined by advancing the needle more medially, perpendicular to all planes, onto a wall of bone that is composed of the vertebral lamina and articular processes (Fig3). Methods: We are currently retrospectively reviewing 50 chest computer topography (CT) scans performed by the University of Florida/UF Health department of Radiology from July 1st, 2016 to December 31st, 2016. 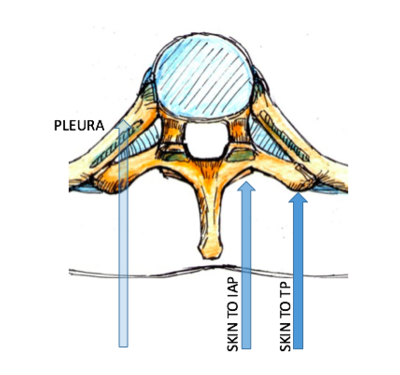 We will measure several different dimensions at the T2, T6 and T10 thoracic levels in order to better understand the special geometry of the bony landmarks that surround the paravertebral space, which include the AP distance from skin to inferior articular process (IAP), from skin to Transverse process (TP), and from skin to pleura (Figs. 1-3). We will also measure the most medial and most lateral aspect of the vertebral lamina and articular process from spinous process. Results: The mean and standard deviation will be calculated for each of the measurements made. Further, we will evaluate for any correlation with BMI and thoracic level. Discussion: When performing landmark-based TPVBs, knowing the range and average depth to the IAP may be extremely helpful in successfully locating a safe needle insertion depth. In this study, we hope to define the average depth from skin to IAP and compare this depth to that from skin to TP. We expect to find that the IAP is 0.5 - 1cm deep to TP but this distance is less than the depth of skin to pleura when performing a TPVB at that same level, giving the proceduralist a safe depth for needle advancement for the performance of TPVB at that level. We will combine the information obtained from this study with our understanding of the anatomy of the TPVS in an effort to increase the success and safety of landmark-based and ultrasound-assisted TPVB techniques.